But before we get to that, I forgot to add earlier that there was a murder in a house on my road while I was away, and we now have a police man\woman stationed there at all times. The NASA news is brilliant, and fantastically will shut up all the conspiracy theorists, and this time we’ll actually be able to watch it! I’ve also seen something about NASA having live, or almost anyway, feeds from the majority of their missions (reliable sources), so presumeably this will be included. Would be awful if millions of surfers saw it crash live though wouldn’t it?! 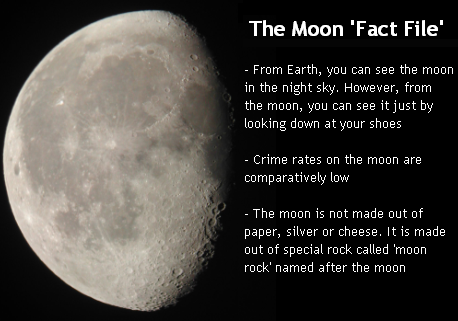 The Moon Fact file is *Brilliant*!